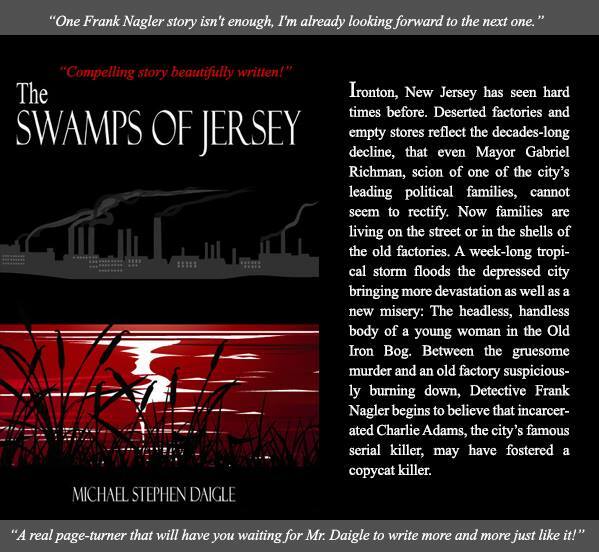 In “The Swamps of Jersey,” Detective Frank Nagler dwells in an emotional shell that descended when his young wife Martha died. In the sequel, “A Game Called Dead,” Martha is still very much his spiritual guide, but in a city that is rapidly failing into chaos. In this scene both worlds entangle. Running through streets left dark by disaster, left vacant by neglect. Past the river that flowed through the city as slow and murky as bad dreams, filling the air with a swampy-rich concoction of moss and dirty brown water. The heavy scent clung to his face in the cold mist like tears and poured through the shadows of the old warehouses, blank reminders of things past, backdrops against which events took place and passed on, things forgotten. Running along narrow side streets, shunning the boulevard’s bright lights, seeking shadows, cracks to crawl through, ways to hide as if the glare of a street light would give away the metal killer’s glint in his eye; he pounded down the alleys of the poor, the junkies whose withered hands grabbed at his flowing coat, can you help me, man, raced through the bowels of the slums like a soul trying to outrun the evil at its heels, like a man seeking pure water to wash the salted bitterness from his mouth. Running like a man seeking release. Then finally the park. Dripping and desolate, fog enshrouded, spectral gaunt trees, leafless, walled, shifting silence. Frank Nagler leaned against a cracked maple and sucked in the cold dampness as if its moisture would nurture the solace he sought. He carried with him the vision of the park in one early spring, a day walking with his young wife Martha. The park would always be green, and he would always be young and Martha always smiling. Here is your voice, he thought. It is always here, hidden in shaded tree tops, a whistle on the wind, a whisper in my ear. The crimson sky mocked by your deeply red hair, your eyes the places I sought for comfort, your soft hands my strength. She was happy here, he thought, in this place where we watched the clouds shift and shape the sky, dreamed, and at the edges of the lawn where the willows and bramble roses thickened, lied naked in love, muddy shouldered, dirty kneed, the wet grass cooling their skin, free and reckless, love transcendent, my beautiful Martha; loved this place even at the end, when her senses failed, caressing the soft red petal of a rose, inhaling its slight, sweet aroma, absorbing the dew that spilled on her fingers, taking with her memories of world, the things and spirits of all they knew; tasting the salt that spilled on his cheeks. I have been writing most of my life. 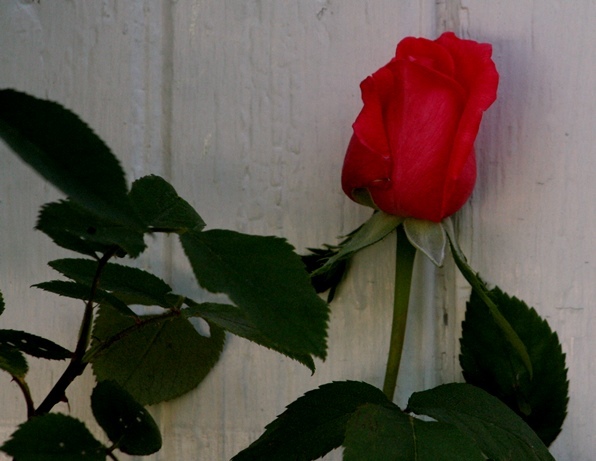 I am the author of the award-winning Frank Nagler Mystery series. "The Swamps of Jersey (2014); "A Game Called Dead" (2016) -- a Runner-Up in the 2016 Shelf Unbound Indie Author Contest; and "The Weight of Living" (2017) -- First Place winner for Mysteries in the Royal Dragonfly Book Awards Contest. This entry was posted in Fiction, Michael Stephen Daigle and tagged "A Game Called Dead", "The Swamps of Jersey" Imzadi Publishing. Bookmark the permalink.